Is this extremely cheap multifunction device a bargain or a false economy? 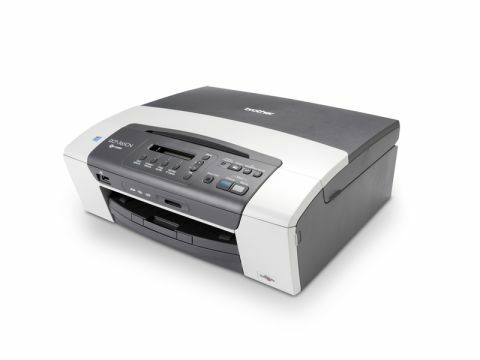 The Brother DCP- 365CN is clearly aimed at the user who only needs a printer every now and then and welcomes scanning and photocopying functionality without making regular use of it. High-end features are cut back to keep the price down. The read-out screen is a single-line monochrome LCD and there's only a single paper tray. But you can still scan documents, enlarge or reduce your colour or mono photocopies and view your photos on your Mac through its SD card reader or PictBridge feature. The DCP-365CN is easy to set up. You can connect through USB or Ethernet, but if you've no interest in network printing, the USB only DCP-195C is otherwise identical and about £10 cheaper. It printed our 20-page text document in just over seven minutes, and tackled a highest quality A4 photo print in just under ten minutes, which is pedestrian, but not sluggish. Text quality is a little washed-out and tired compared to the latest pigmented-ink printers, but the characters are clear and consistent, even at very low point sizes. Its photo prints are clear and precise, with smooth gradient ramps and very little banding, though the colours were a little bleached, especially on flesh tones. Having to remove your standard A4 paper and replace it with photo paper in the printer's one and only feeder tray is quite annoying too. Inevitably, the Brother DCP-365CN can't match a top-range HP or Canon for print quality or feature range. Yet for the price, it's excellent value for money.